Clean-running MaxTorque™ diesel units are available with up to 30-horsepower engines that meet and exceed federal Tier 4-I emissions requirements, and they are B5-ready. 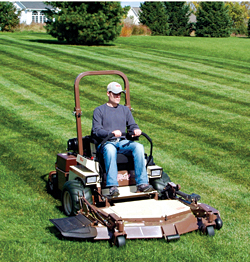 They feature fuel-injected, diesel engines, and they offer powerful performance in tough mowing conditions. They can save 700 gallons of fuel, and they produce labor savings resulting from 70 fewer stops to refuel.